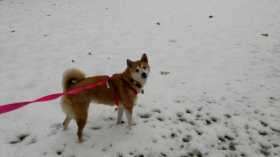 Lexi, female red Shiba Inu 25 pounds She was wearing a pink harness and leash. She was spooked and ran away. Last seen in White Lake WI, Langlade County Please do not chase, she is skiddish She is not familiar with her surroundings.